Hello fabulous One Krieger Chick friends! I am Seng from Sengerson. I am ecstatic to be guest posting on Ariean’s online home. I met her at Go Blog Social, and she was one of the sweetest gal’s there! 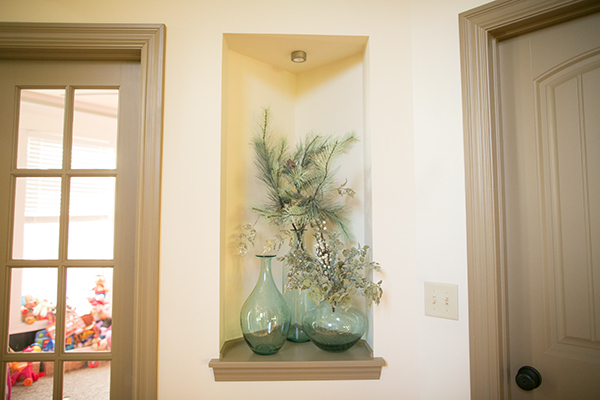 That’s where I found out that we had a lot in common – especially the desire to make things pretty around our home. Over at Sengerson, I share my home decor DIY projects in and around the house as well as a sprinkling of my motherhood journey. Today, I’d like to share with you an awesome tip that I learned from Nell Hill’s, one of my favorite home decor stores in Kansas City! 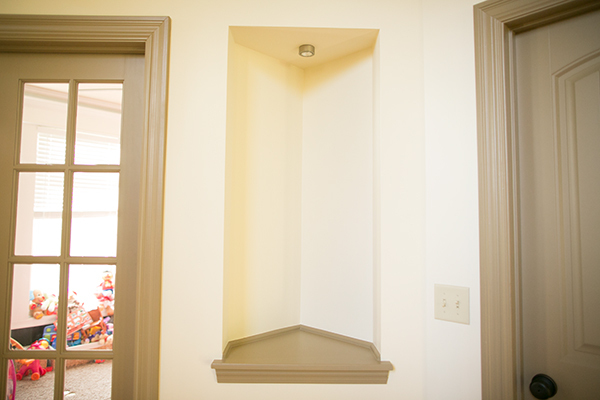 First, I wanted to explain the problem at hand: I had a weird little nook that I needed to fill. After brushing aside my crazy husband’s idea of a stuffed wood duck, I decided to take a trip down to Nell Hill’s where one of the sales associates, Deborah helped me. She said that there is something to be said about a “piece” that can be decorated year round. I explained to her that the art nook I was intending to decorate had a odd triangular shape that had a great cam light feature (shown below). Deborah disappeared for a few minutes after I explained to her my dilemma. A few minutes later, she magically popped out of nowhere with THE perfect pieces for this nook. 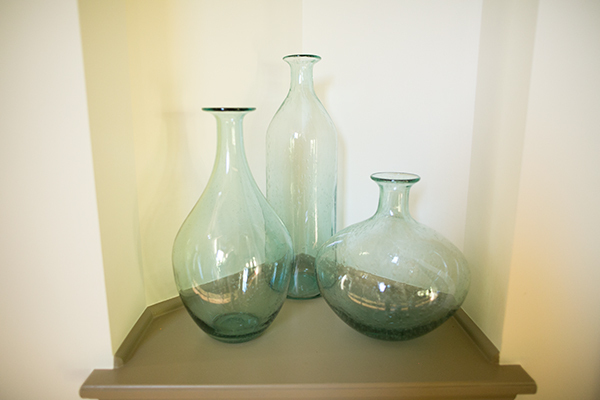 It was three glass vases in varying sizes and shapes. There was what I was looking for – in all its glory. 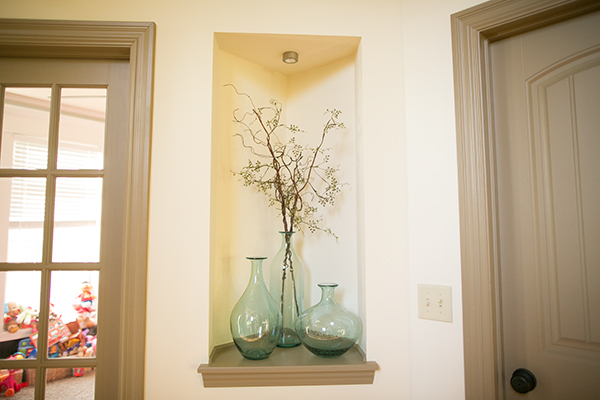 It’s perfect because the varying heights of vases allows one to decorate as much or as little as desired, and it would still look great. 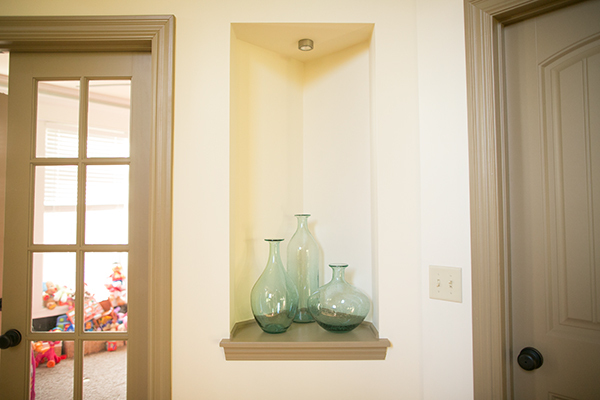 Each of these glass vases ranged from $20 – $60 EACH. Thankfully, I saved the gift cards I received from two Christmas’s ago. However, I did find a less expensive option that I’ll tell you about in a moment. Even without any decor in them, I think it looks great in the nook! For spring, I put two branches, criss crossed, and that was it. Easy peasy. For the fall, I went all out and exploded all around it. I think it looks uber cute! For winter, this is what I’m planning on doing. Its a white/clean/sparkly themed Christmas for our household this year! Alternatively, if you can’t swallow $100+ for all three of these vases, there is an awesome Ikea version you can use. This is very timely for our Kansas City based One Krieger Chick readers! 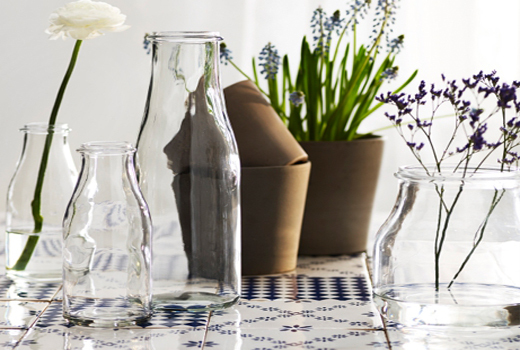 Ikea carries the Ensidig Vases in various sizes, and they are around $4 each. Amazing!! 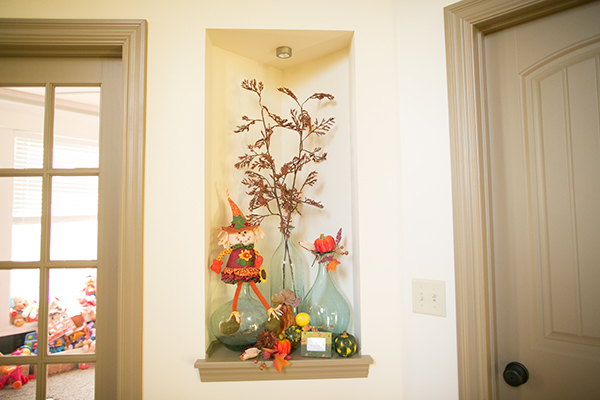 What’s your favorite piece that you decorate around ALL YEAR round? Seng is a mother, wifey, and photographer. You can find her at sengerson.com. She is the ultimate purveyor of the “honey do list”, which she then blogs about it. That’s how she rolls. Follow her on twitter and instagram!